While the whole world is going crazy about the recent iOS 6 update of Apple, I am currently stuck on 5.1.1 and not choosing to update. That is because my iPhone 4 is jailbroken and updating it will make me lose the jailbreak. Though this situation may seem unfortunate for some, for me it's not. I'd rather have a jailbroken iPhone stuck on a previous version than run it on a recent but stock version of iOS. I will choose having a jailbroken phone any time. For someone who has been jailbreaking the iPhone for 4 years now, that decision is a no-brainer. I could give you a hundred reasons why. But, I think it would be better to just show you the current jailbreak tweaks I have on my iPhone. Here are the current tweaks I have installed on my jailbroken iPhone 4 running on iOS 5.1.1. I will post it with some screenshots and a short description so you can marvel at some jailbreaking awesomeness. One of the main reasons people jailbreak is to customize the look of the iPhone. The current theme I am using is called Ayecon (pronounced icon). As the reviews say, it's probably the most elegant iPhone theme created so far. You can't probably see it from a screenshot point of view but majority of the icons were redesigned beautifully to give them a fresh new look. Notification center, Music App, Switcher + Controls and even the Phone app were given a new detailed look. It's constantly being updated too. 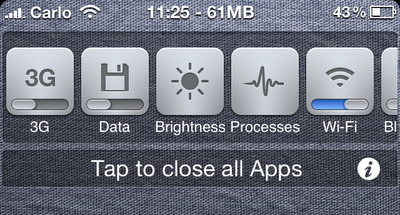 The Barrel tweak gives my icons a cool animation when I slide from page to page. This is actually one of my favorite tweaks. The screenshot doesn't even justify how awesome the tweak is. You should see it in action. I should call this one of the essential jailbreak tweaks. 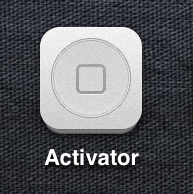 Every jailbroken iPhone must have Activator installed. This tweak allows me to set up custom gestures to replace the basic functions of the iPhone buttons and the iOS. For example, I have a broken home button. So, I had to set up a custom gesture (swipe from bottom right of the screen) to simulate the press of a home button (I really don't like the Assistive Touch button). Isn't that amazing? This tweak is also linked to a lot of jailbreak tweaks so it should be pretty useful. In addition to the awesome Ayecon theme I already have, I also chose to stay away from the boring iOS lockscreen that everyone is familiar with. Typophone 4 turns the clock and the date on my lockscreen into some really cool typography. I can still change the wallpaper by the way. I just used this blue one because it blends with the home screen wallpaper I am currently using. Did you notice the background? That's the Typophone 4 tweak above. So, basically I was able to access Notification Center on the lockscreen. This is not possible when I am on a stock version of iOS. Aside from making me access the notification center on the lockscreen, the Bulletin tweak also allows me to collapse the app sections (see Reminders and Calendar on the screenshot) on the Notification Center. This becomes really useful when I get flooded with a lot of notifications. I also get the benefit of customizing the notification center the way I want it to look. From the screenshot on the left, you could see how I was able to make the notification center transparent. 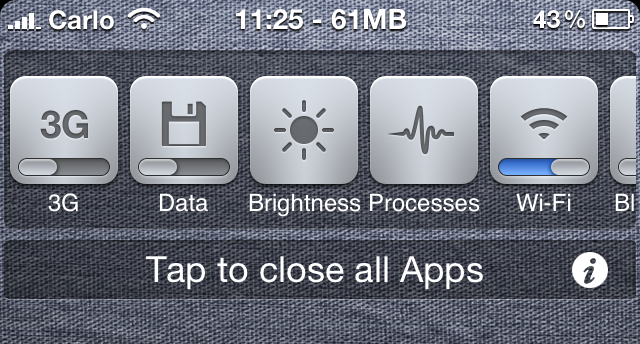 There is a lot more to this tweak on its settings panel. Copic (shortened version of 'Contact Pictures') is a simple tweak that's useful for picture obsessed people like me. Well, not really obsessed. I just love having contact pictures everywhere. In my contacts list, 80% of them already have their pictures saved. So, wouldn't it be great to show those contact pictures on the contacts app? How about the Messages app? or the notifications for Messages and Twitter? Well, Copic does all of those for me. The most time consuming part is the manual adding of pictures to your contacts which I understand is now a feature of iOS 6 (grabbing all their pictures from Facebook). There are times when having a Passcode is really useful. Sometimes though, it gets pretty annoying to type those numbers (or letters when you have the long passcode) again and again . This is where Clever Pin comes in. I can disable the passcode in certain situations. On my iPhone, I set Clever Pin to disable passcode when it is connected to my home wi-fi and when I am playing Music. That means when I am at home, I get to unlock my iPhone without having to enter my passcode. When I go out of the house, it magically enables itself back. 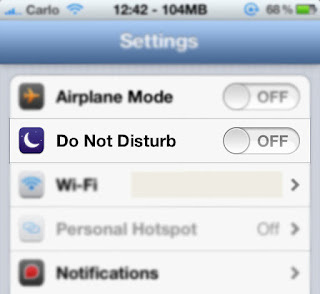 While people who just upgraded to iOS 6 just had this feature, I've been using this tweak (Do Not Disturb) for months now. It works the same as the one you get on iOS 6. Once it's enabled, the notifications I get will automatically pile up on my notification center without disturbing me with sound and screen alerts. Nothing really special with this tweak except for the fact that I do not need iOS 6 to take advantage of the feature. SBSettings is again one of those essential jailbreak tweaks every jailbroken iPhone must have installed. It allows me to access system controls from anywhere (in this case I set the controls to appear on the notification center). This means switching 3G, Cellular Data, Wifi, Bluetooth, Location Services on/off plus setting Brightness does not mean going to the settings app. I can access and do it from anywhere on the iOS as long as I get to access Notification Center. That and a lot more (including how I changed my carrier name to 'Carlo') from this tweak which has its own settings panel. Lastly, WeeKillBackground allows me to kill all multi-tasked/open apps all at once. That means I don't have to open the switcher, hold an app to wiggle and close each one of them. I just click "Tap to close all Apps" to simultaneously close all of them. I do this from time to time since I love to free up my RAM to avoid lag. There you have it. Those are the jailbreak tweaks I currently have on my iPhone. Bear in mind that these are only tweaks. I still have apps installed that give additional functionality to my iPhone. But, if I include them here, it would be a really really long post. I might have a dedicated post for them soon. Also, not all of the tweaks mentioned here are free. So, as an added bonus since you've reached this far in reading this article I can guide you through getting all of the tweaks mentioned here for free! Just contact me here or add a comment and let me know if you want it. I'd be happy to reply and help you with it. Anyway, I hope at this point it's already clear why I would always prefer having a jailbroken iPhone. Not only do I get added functionality, in a way it makes me ahead of everything by making the phone more powerful than it already is. After all, I wouldn't want to invest in an expensive piece of equipment when I can't get the most out of it. The choice is yours now. To jailbreak or not to jailbreak?